Is the House of Commons becoming too powerful? In my 2016 Michael Ryle Memorial Lecture, I developed the theme that for Parliament these are the best of times and the worst of times. It was a theme to which I returned in my Daily Telegraph article earlier this month (see my earlier post). They are the best of times in that, in relation to the executive, Parliament is the strongest it has been in the era of modern British politics (which I treat as post-1867). They are the worst of times in terms of the relationship to the public, which exhibits little trust in politicians and the institution. Is the former affecting the latter? Is the House of Commons reaching a stage where it is arguably becoming too powerful? There is a tendency to take a strengthening of Parliament as an obvious good. However, some years ago, Anthony King penned an article entitled, ‘How to strengthen legislatures – assuming that we want to’. Very few appear to question the assumption. There is a case for strengthening Parliament as a policy-influencing, or reactive, legislature, that is, fulfilling the functions of legislative scrutiny, administrative oversight (colloquially, calling government to account), and debate, ensuring the voices of citizens are heard. These are functions particular to Parliament. They are carried out in relation to government. Government maintains a discrete role, crafting and bringing forward policy to which Parliament then responds. The distinction between the tasks of government and Parliament is core to accountability. 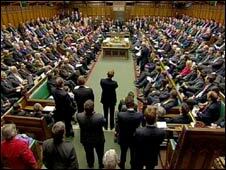 The government is accountable between elections to the House of Commons and at elections to electors. Voters know who to hold to account for the outcomes of public policy. We are now in an unprecedented situation in that there is basically a tussle between government and different configurations of the House of Commons for control of policy over Brexit. The situation is complicated, not to say confused, by the fact that the government itself is not united; neither is the Opposition (the alternative government, which it is why it is designated formally as the Opposition). This creates a problem in standing before the electors as unified entities. In the Commons, there are different combinations of Members coalescing behind different approaches, in effect trying to achieve a different policy outcome to that proposed by government. It is not a case of the House of Commons saying aye or no to government, with the onus for generating policy remaining on government, but rather combinations of MPs attempting to substituting alternative policy or policies. This creates a confused situation in terms of accountability, not least if a different policy outcome to that proposed by government is achieved. There is no one body that can stand before the electorate to be held to account. The situation arises from a unique combination of events: the 2106 referendum; the divisive nature of European integration, which has divided the parties and created divisions within parties throughout the post-war era; the election of Jeremy Corbyn as Labour leader; and the result of the 2017 general election. All this against a backdrop of MPs’ willingness to vote against the whips; long gone are the heady days of what Sam Beer referred to as ‘the Prussian discipline’ of MPs. Electors do not reward parties that are seriously, publicly and consistently split. Not only does this not help parties, but the divisions and uncertainties are not helping how people see the House of Commons. The House is divided across a range of policy positions, rowdy and contributing to uncertainty. MPs appear more concerned with pursuing their particular policy preferences (convinced – whatever the stance is – that they are so obviously right) than they are with the reputation of the institution of which they are members. The government is still in the driving seat, in that it is responsible for negotiations and determines its business schedule in the House (which it has used to delay debate on the withdrawal agreement), but there are others in the vehicle seeking to grab the steering wheel. In fulfilling the reactive tasks ascribed to a policy-influencing, as opposed to a policy-making, legislature, both Houses are doing a good job, far better than ever before (hence the best of times). Look, for example, at the work of select committees in both Houses, including in examining the consequences of Brexit. Strengthening both Houses in fulfilling these core tasks is to be encouraged. However, in seeking to wrest control of policy from government, MPs are creating what may prove to be a short-term aberration, but while it lasts it creates an uncertain, and potentially perilous, situation. This entry was posted in Uncategorized and tagged Anthony King, Brexit, European integration, House of Commons, Jeremy Corbyn, Michael Ryle Memorial Lecture, policy-influencing legislature, policy-making legislature, Sam Beer. Bookmark the permalink. 5 Responses to Is the House of Commons becoming too powerful? Theresa May is perhaps the least competent Prime Minister since Piers Galveston (and he wasn’t exactly a PM), with a seriously mishandled Brexit negotiation and an unwillingness to make hard choices in a timely fashion, leading to her current unacceptable surrender deal, so there would have been difficulties in any case. However, problems have been aggravated by the attempt to shoe horn referendums into a Parliamentary system especially with a reluctance to repeat referendums, the novel situation of party leaders being chosen by the membership rather than MPs and therefore not always having the full confidence of the latter, and the Fixed Term Parliament Act removing the historic link of particular votes with votes of confidence. Further and better thought through reforms are probably needed to make the system work. What must be addressed urgently is the ridiculous choices of individuals who are patently not suitable for a position simply because they are politically correct to present. How insane is that? This PM was not chosen by the membership. She was chosen by the back room and pulled from a membership selection. Now I wonder why that was? Could it be because the choice would not have been for the candidate wanted, one offered who clearly was/is unable to perform in the position? The entire process, both sides of the spectrum, is unfit for purpose. This is why those in positions of power are clinging to foreign leadership. They are fully aware ours have lost the ability to run a civilised and democratically led country because of ‘idealism’ rather than pragmatism . I wrote a response to your post. However, it was binned. To paraphrase. I agree with your thinking entirely. The underlying question is, why is it being allowed to continue? Where are those who can honour the peoples choice? Who is really responsible for this situation? There was more but this was it in a nutshell. Thank you for being courageous enough to write what is obvious but ignored. I wonder who initiated it?